The experience of living in a house involves much more than its architectural design and layout. The popular wisdom of “location, location, location” translates, in the past tense, into neighborhood context or setting. When we lived on Russell Street, a big part of the neighborhood landscape – and soundscape – was a complex of brick buildings directly across the street from us that takes up much of the block within Russell St., Oregon St., McGee Ave., and Grant St. We knew it was some kind of Berkeley Unified School District maintenance building, and that relatively large trucks started pulling in and out of the interior courtyard relatively early every weekday morning. But nothing immediately visible on the buildings told us that, between 1916 and 1933, this was Edison Intermediate School. Instead of delivery trucks, for almost two decades the residents of our Russell Street house heard the clamor of adolescents throughout the school day. Edison was a hell of a nice school. They had a print shop that did printing for the school, and wood shop and metal shop. They had a real forge in metal shop–you could make a horseshoe if you wanted to. We had a Model T Ford there–one of the old ones that didn’t have an electric generator in it. It had a magneto that you had to crank to get a spark to start it. [chuckles] One time we hooked it up to the teacher when he wasn’t looking. We really had him hopping. 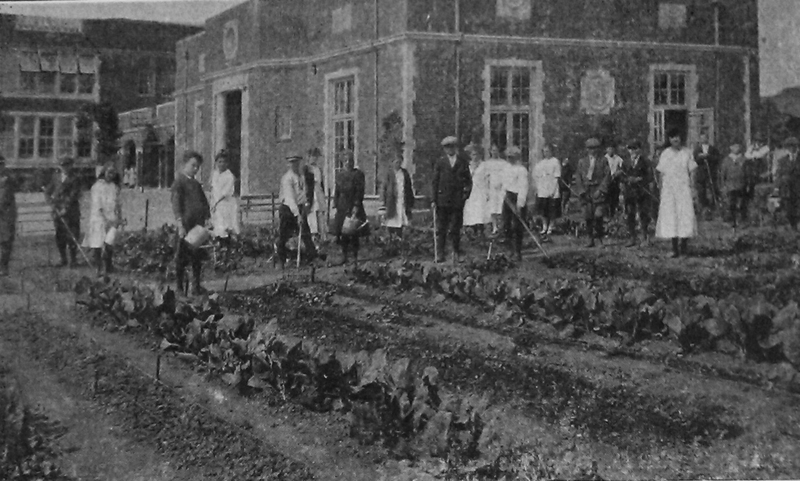 Between 1916 and 1919, the open area south of the original school buildings was used by gardening classes who grew ornamentals and vegetables for public sale. The residents of our Russell Street house would have been able to see the garden grow (and the students laboring in it) right out the front windows. 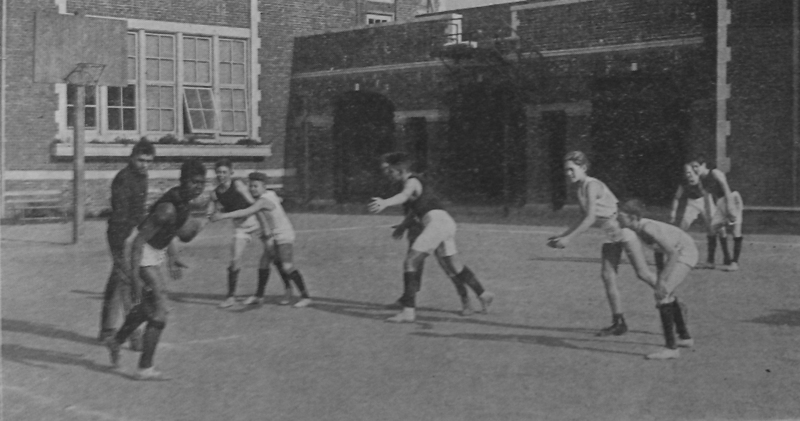 Team sports, including basketball and baseball, were a significant part of school and neighborhood life from the early days of Edison and were played outdoors until the gymnasium – the brick building closest to Russell Street with the large, arched gable-end window – was built over the garden area about 1920. In a 1977 Regional Oral History Office interview, former local resident Alvin Sweetwyne remembered that young people from local African-American families gathered in this gymnasium for evening basketball games. 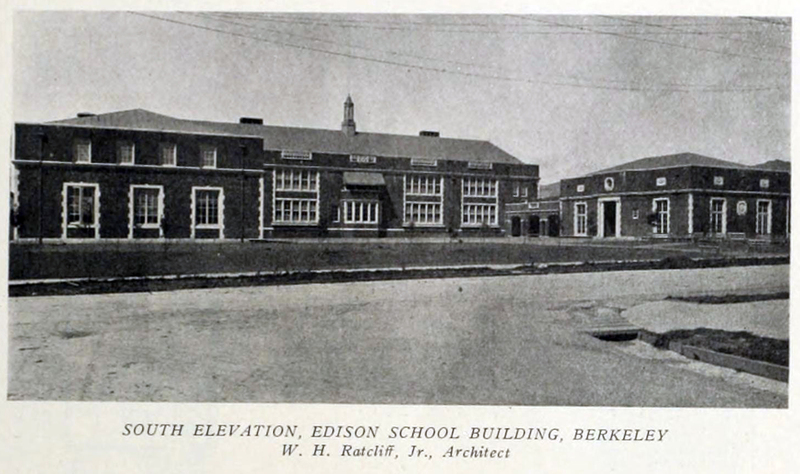 Constructed of brick and reinforced concrete, Edison School was deemed seismically unsafe and closed to students not long after the Field Act of 1933 was passed to ensure earthquake safety in California schools. 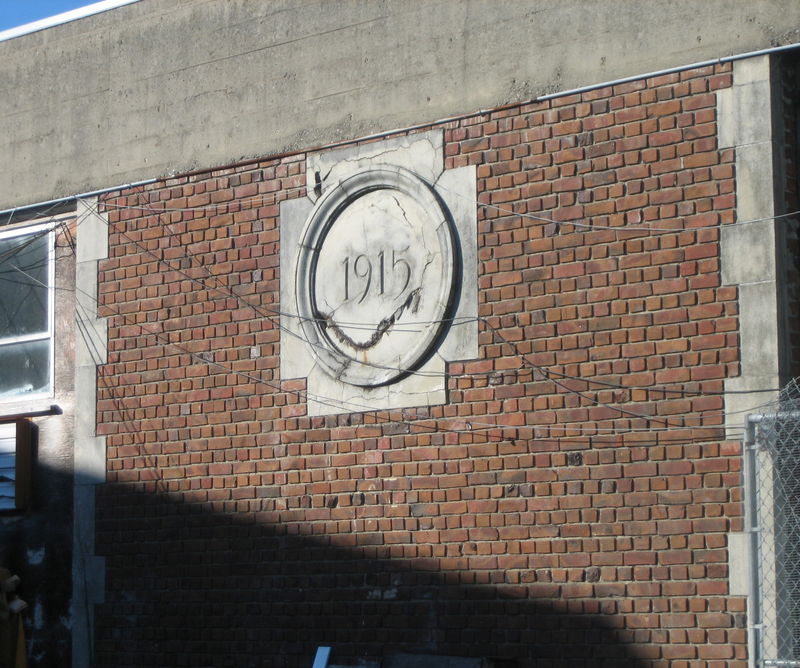 In the mid-1930s the upper story of the portion facing Oregon Street was removed. Despite alterations, the building was still considered unsafe for students and was re-tasked as a maintenance facility for the Board of Education. 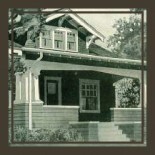 If you want to hold an artifact of the school’s print shop in your hands, many volumes of their biannual yearbook, The Mazda, can be perused in the Berkeley History Room of the Berkeley Public Library’s main branch. Part of the east wing, as seen through a chain link fence. *Each of the five new schools was designed by a different architect: Garfield School by Coxhead and Coxhead; Luther Burbank School by Walter D. Reed; John Muir School by James W. Plachek; Francis Willard School by Hobart and Cheney; and Edison School by city architect Walter H. Ratcliff. This entry was posted on January 8, 2012 by StacyK in Neighborhoods and tagged Berkeley, schools.